This was indeed the trip of a lifetime. 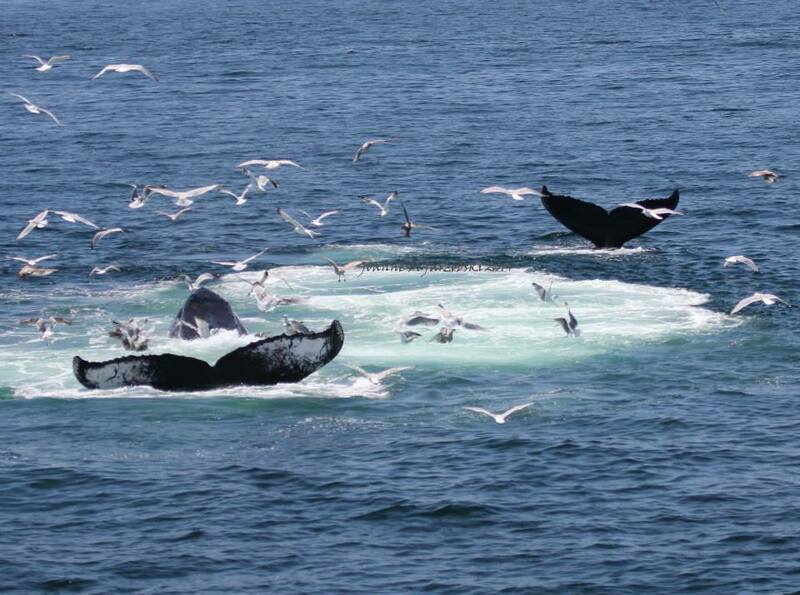 We have been on whale watches before but because the Stellwagen Bank National Marine Sanctuary in Massachusetts Bay offers especially good eating (much like Cape Cod itself), the whales hang out there in great numbers. 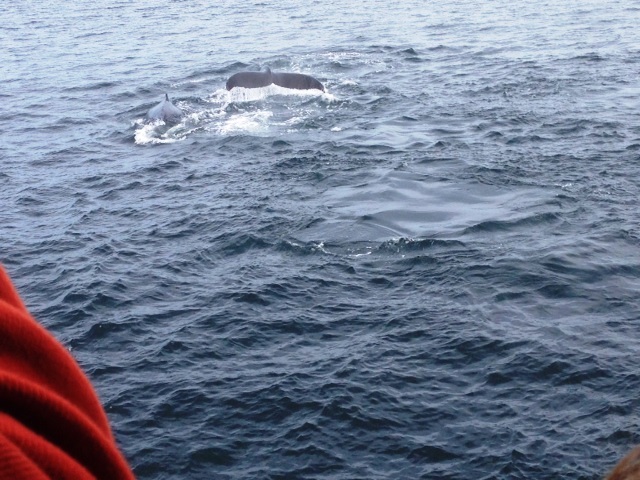 but honestly, the whales were really close and doing lots of stuff like tail breaching and fin slapping. I was torn between photographing them and watching them and watching took precedence. 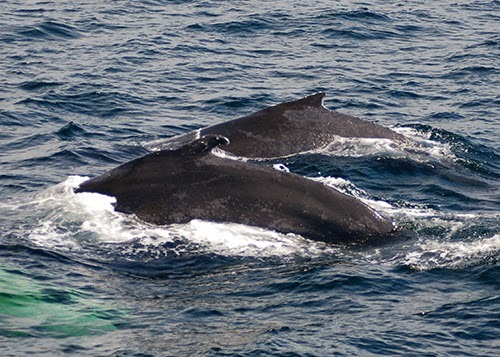 Mothers with calves, whole pods of easily identified returning humpbacks and two immense finbacks were all around us and under us. The finbacks, we were told, are the second largest animal ever to live on earth; the first is—the blue whale. Both whales are larger than any dinosaur ever was. 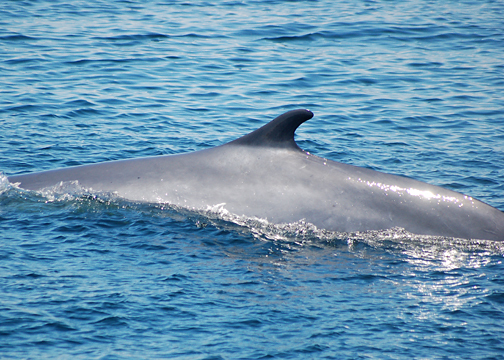 Just so you get the sense of the finback, remember you’re seeing only a third of the animal as they don’t breach. All the whales, particularly the new moms, were diving down and scarfing up tiny eels at one-two tons per day to make up for the hungry days in the Caribbean where they traveled to give birth. 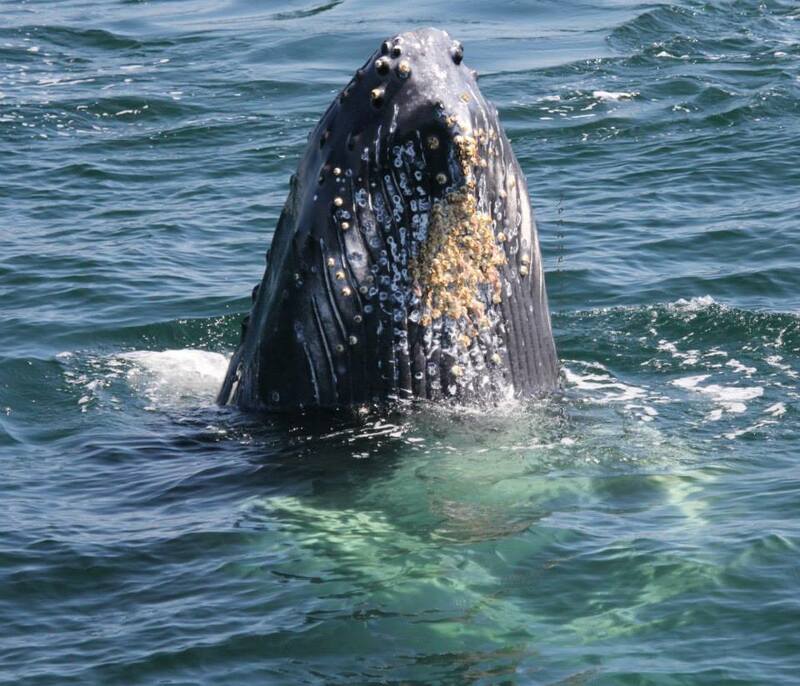 All the whale watches, from Boston, Plymouth, Provincetown, Hyannis, and Nantucket go to the Stellwagen Bank as you are almost sure to see whales. The messaging is just right–“this is not Sea World,” “these animals are free,” “they are under threat,” and “we don’t guarantee you’ll see them,” but apparently most people do, and it was clear that the boats didn’t bother them at all. (Source: captainjohnboats.blogspot.com) After they had removed the netting, our field guide who had been there said Nile breached many times; don’t tell me that wasn’t joy. This report by Shelly Butler was a particularly invaluable in these days when creatures of the wilderness of so many species seem threatened and potentially under attack. 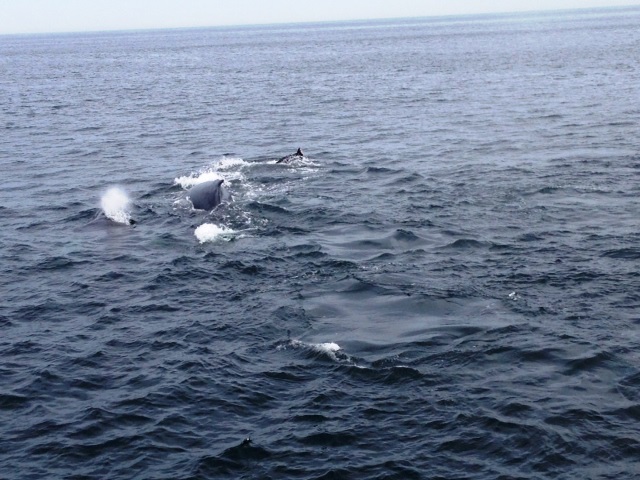 For those of us here in Manhattan to read that a trip just up to the Cape can afford such visible access to whales, Wow!